Browse the latest hen party ideas, activities & packages. Saving time, hassle & money! Great hen do, made even better with Funktion Events! 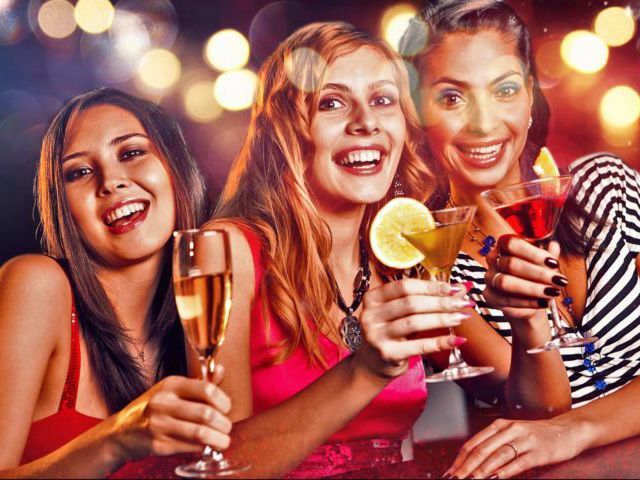 An unbeatable selection of hen party & weekend ideas across the UK & Europe for 2019. Over the last few years, the event organisers at Funktion Events have sent thousands of ladies on fabulous days and nights out all across Europe and the UK, innovating hen weekend ideas and experiences to make hen do planning a lot smoother, and the last night of freedom truly one to remember. To accommodate every kind of bride to be, we offer a wide variety of hen do activities to treat the budding bride with, and a bunch of cheap hen weekend ideas that will make your jaws drop and your eyes light up with excitement. From cocktail making to sports days, from quad biking to dance parties, we’ve got the works – and we’re here to do all the planning for you! With Spring well & truly upon us you may be trying to figure out some of the best last minute hen party ideas! We all love a good theme when it comes to a celebration no matter what it is. Whether you book just one or a whole hen weekends worth of hen do activities to cherish with the girls, we’ll make sure it’s all organised so you can relax. 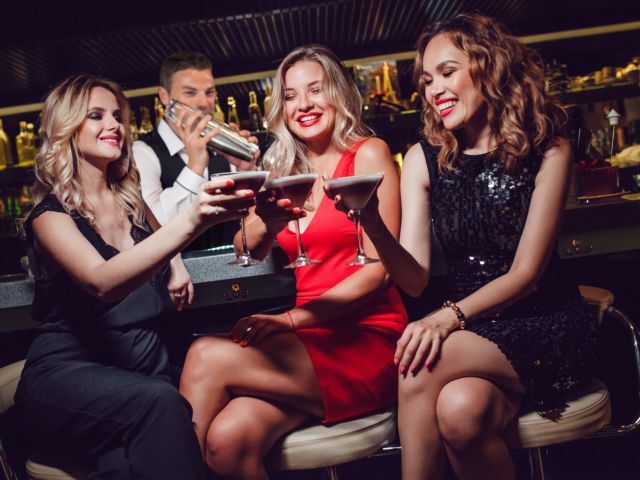 Of course, we’ll keep all your day and hen night ideas within the city of your choice, with everything you book being near at least one or two bars – what’s a bachelorette party without a few cheeky cocktails, right ladies? If you’re booking an overnight stay with us in the form of great value cheap hen weekends, all of our hotels are branded national chains so you can look forward to luxurious quality and a good night’s rest, ready for the celebrations ahead of you. It's not just the core of the bridal party that we'll get sorted for you, anything and everything you might need to help make the celebrations a success can be found through Funktion Events. Need some hen accessories? If you’re not sure where you want to head for the last night of freedom, we can help you build your hen weekend from the ground up. Hen do locations are important for so many reasons, so make sure you do your research before you put all your eggs in one basket! Packing the celebration full to the brim with exciting hen party activities is always the fun bit! From foodie events to a hen party at home, classic cocktail making to crafty fun, weigh up all your options to combine the perfect set of hen party activities for your bride to be. You know what they say, the early bird catches the worm and that rings true for hen party packages. If you’re getting your mates hen do organised way in advance, save some pennies with package deals. Plus, everything is done in one go, in one place – way less stressful! Hen weekends can be a lot of pressure, especially if you’re not a natural born hen party planner. Take a peak at our hen party planning 101 guide! We’ve packed everything we can possibly think of into this guide, including a few freebies to make your job as maid or honour/­bridesmaids a little easier. hen party special offers speaks for itself really. 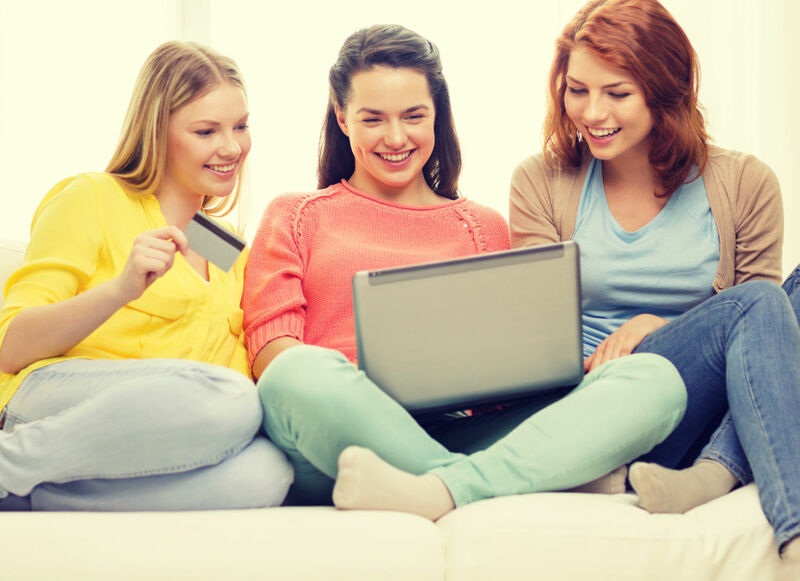 Before you commit yourself to a hen do, it's best having a quick browse at some money saving options that might just fit your budding bride down to T.
More often than not, the best way to decide on products/­services/­places to eat or anything is to look at reviews from real people like you. Hen party reviews can be found individually on each activity page, or in a whole bunch on the page linked here. If you’re starting from scratch, sometimes hen party ideas & inspiration can really great the brain ticking. 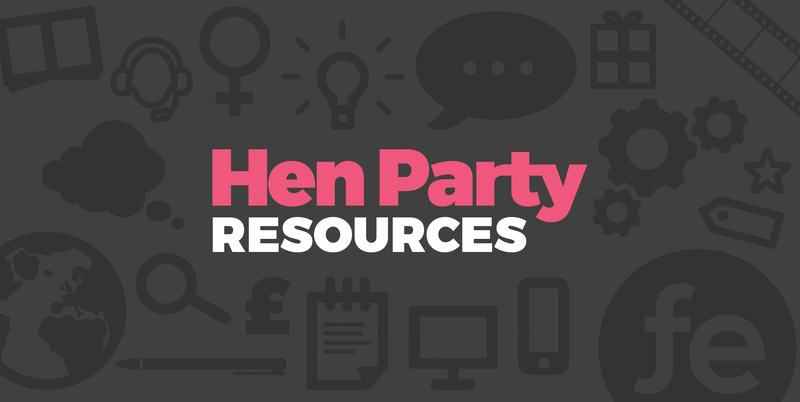 From hen party theme ideas to helpful freebies – this is the home of everything hen party ladies! Hen parties, bridal showers, weddings, honeymoons; they all go hand in hand really don’t they? The hen party blog is compiled of useful blog articles containing top suppliers like wedding photog­raphers, write-ups about the best hen party abroad destinations and everything in between. Take a look at some of our deals and treat yourself to some feather bowers, L platers and willy straws! Longing for a few hen party games to add some silliness to your event? Download our free games in just a few clicks. 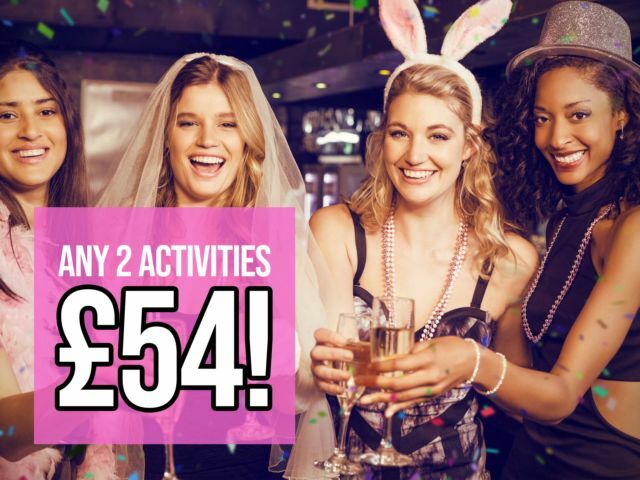 Whether you're booking a last minute hen do this year or you want to book early for your hen party 2019, we’ll help to get you the best offers around, making sure you receive high quality treatment and exceptional services at as low a price as possible – we know how much weddings can be, so every penny counts! 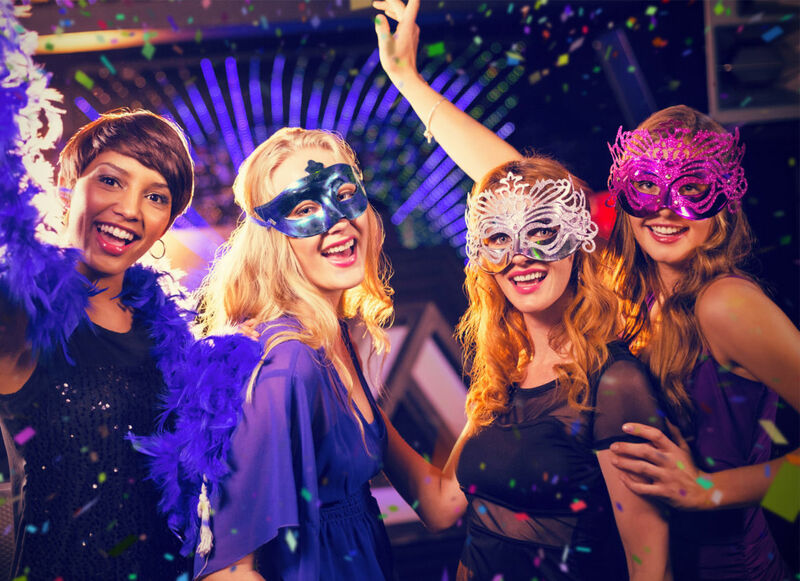 When choosing Funktion Events, you can rest assured that a dedicated events manager will be on hand to look after your group, putting everything in place while you look forward to the memories of the hen weekend. 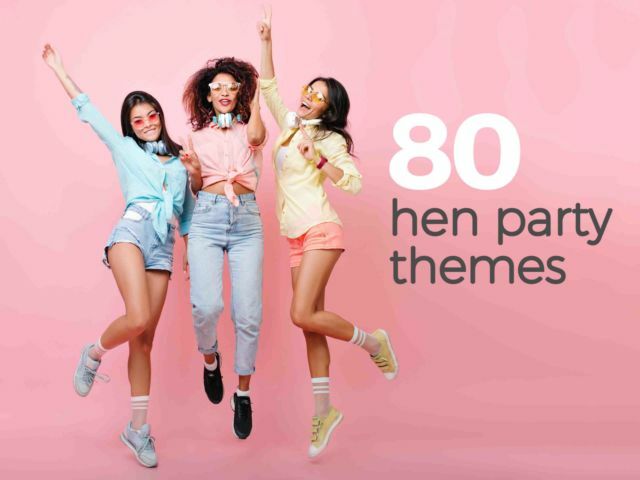 Above all that, the amount of hen party ideas we have available in over 50 countries, it's hard not to find something that will suit your bride to be down to a T.
Before you even think about all your hen do ideas for the weekend, you need to plan where you're off! Whether your bride is a sun loving queen or she likes to keep it simple in her hometown, we have over 60 unique party cities throughout the UK and all over Europe to tickle your fancy. Everyone is different with the ways they want to celebrate getting hitched, but we guarantee that one of our impressive destinations will provide just what you need to make the hen do one to truly remember. From Brighton to Edinburgh and across the pond in Dublin, it’s easy to get lost in the immense amount of cities possible. If you’re planning a celebration for your hen group that's a little further afield, a stunning European trip ticks all the boxes. Head over to glamourous Spain and become a señorita with a classic Spanish hen night with a sunny twist, or explore new adventures in the gritty city of Amsterdam and be blown away by the culture. No matter where you want to go, an events manager will be ready to plan your weekend getaway to make the bride to be grin from ear to ear. With so many activities and experiences flying about for this year and any hen party 2019 organising, it can be hard to pin down a few that your bride to be is really going to enjoy. From unusual hen party ideas to the more fun hen party ideas and everything in between, no matter what bride to be you're catering for - we'll find her an activity. We totally understand that it can sometimes become overwhelming for a maid of honour to choose from a big batch, and that’s where we come in. Read through a few top tips articles and hen do ideas guides to get a feel for what’s on offer and where. Or, simply use our filters to sort the hundreds of activities into different categories for your thrill seekers brides, the craftier hens or foodie lovers – there’s something for everyone! 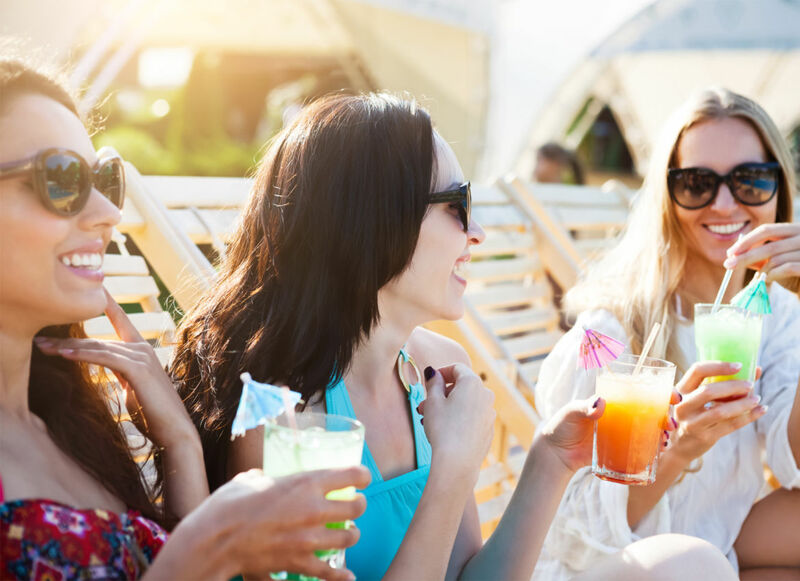 When you book lots of little things separately across the hen weekend, the costs can start to pile up and tend to get a bit out of hand – but that’s where hen party packages and hen weekend ideas lend a helping hand. Dozens of bridesmaids planning the big hen do opt for hen weekend packages, and it’s not hard to see why seen as everything is done for you, all in one place, all for one price! These cheeky little gems are where you’ll find the best deals and offers, and are the number one way to take some of the wedding stress off your shoulders. With the accom­moda­tion sorted, a couple of excellent activities lined up and a full weekend of celebrations to look forward to, we’d say it’s time to pop the Prosecco and put your feet up. And with packages growing in popularity, so are the hen weekend ideas that come with them. From dancing to drinking, from competing to eating, there's something for everyone. Booking a hen party in 2019? Get it sorted early - start with your hen party location! We’re sure you’ll agree the Internet is a wonderful thing, and with this we’re able to keep you updated all around the clock with a fabulous VIP Events Area. One of the biggest perks of having a hen do planner online (like Funktion) is the 24/7 access it comes with. 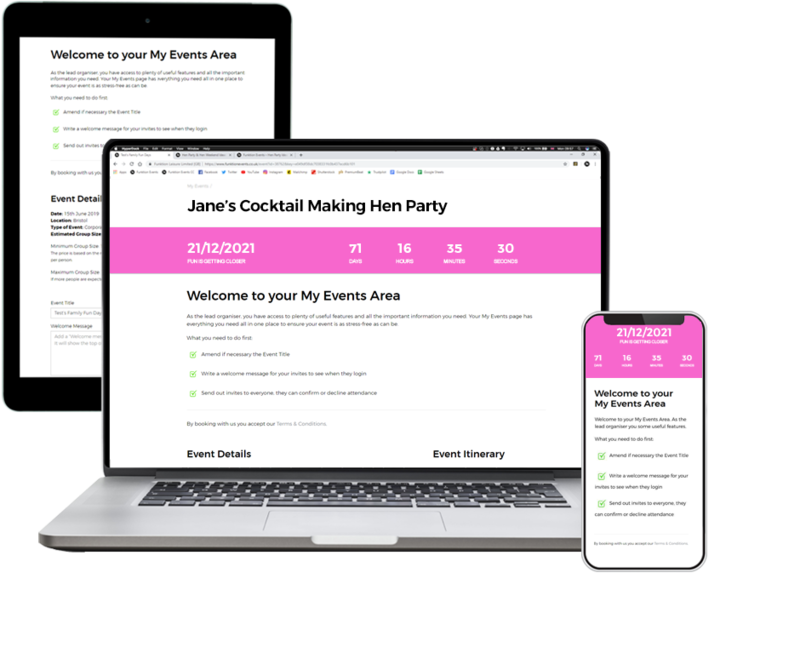 When you’ve chatted to your events manager and decided on the hen party ideas that grab your eye, we’ll provide your group with your own little area of the website to plan all the bits and bobs of the celebrations. 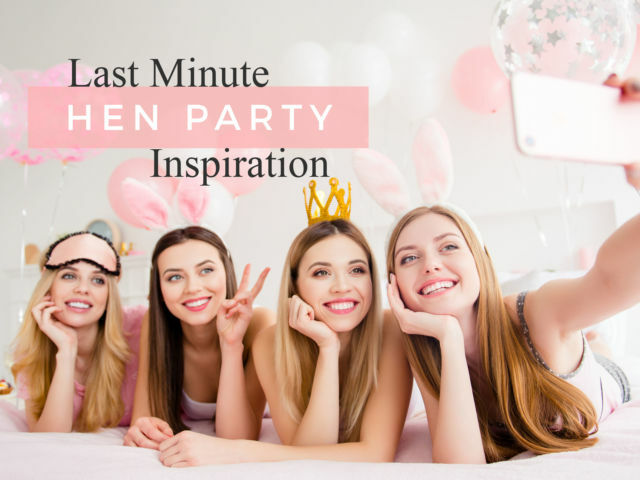 From a huge countdown to get you all giddy, to a full itinerary and even a place for all the girls to make individual payments, this page has all the tools for you to become a mini party planning queen.